For anyone interested in buying a board, I recommend going to eBay and looking for a cheap used one to try the idea out. 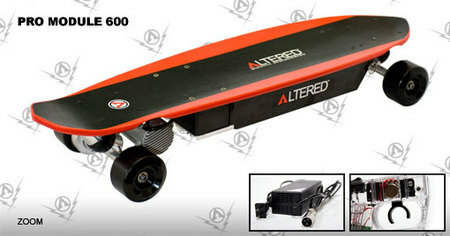 My first board, a vaguely toy-like e-skateboard ($31 on eBay in 2004) had an 80-watt motor (still surprisingly powerful — it managed to tow four people at one point). I bought a few other cheap used ones, and then, having decided these things were indeed awesome, I decided to spend some more money on a proper board for getting around the city. I got a 250-watt Exkate Raptor 3.0 for $320, which I talked about in an earlier post. The old 250-watt board was still not quite powerful enough to climb Somerville hills without complaint (I’m at the upper end of the 170-lb weight limit), but this new one has a 600-watt motor, which handles them no problem. 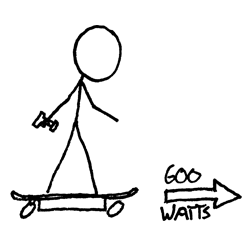 According to Science, 600 watts is about 80% of a horsepower. This suggests that if you found a smallish horse (say, 75% the strength of a standard one), and started a tug-of-war using this new board, you could actually win. This is of course dependent on friction and when the board can actually supply maximum power and so on. But let’s pretend it would work. Edit: Taylor of Exkate posted with some technical info, and I answered some other questions in the comments. He mentions that if you want to order a board, call him (949.951.9500) and mention xkcd for free shipping (which can be significant). Disclaimer: They aren’t paying/giving me anything, they didn’t ask me to write this, etc. If you’re interested but don’t want to spend a lot yet, I recommend trawling eBay for a cheap board to try the idea out.